Welcome to the TEAHOUSE of the AUGUST MOON .com! 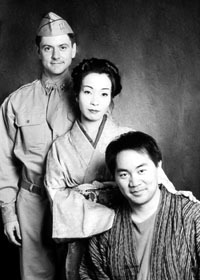 Paul Denniston (Captain Fisby), Kaz Mata-Mura (Lotus Blossom), and Keisuke Hoashi (Sakini). Critics and audiences alike agree! THE TEAHOUSE OF THE AUGUST MOON is one of the best shows of the year! Real Quotes from Real Audience Members! "I saw the original on Broadway (in 1954), you were just as wonderful. I'm going to tell all my friends!" "Every time the curtain closed for a scene change, I was so impatient for it to open again, because I wanted to see more!" "I laughed so hard my cheeks hurt!" "It was so great - you made me laugh, you made me cry ... I'm still crying, you were just wonderful!" "You should be packing the house every night, with a show as good as yours." "Young people need to see this play to know about post war history." "The comedic timing was perfect." "If the El Portal Theatre had done shows like this, they never would have closed." "I'm really glad I came, this is a great show!" "This is the kind of show that makes me wish I was in the cast! You guys are having too much fun!" "Perfect way to introduce Japanese culture. It's entertaining, accurate and educational! My daughter (6 year old) never seen a traditional Japanese dance before and she was really fascinated." "The many humorous 'clash of culture' dialogs had us laughing even as recalled them on our drive home." "This is 3rd time I came to see this show! I wish you guys would extend it!"